Noir Wallpaper: Where Am I?! Minitokyo »	Noir Wallpapers » Noir Wallpaper: Where Am I?! Happy Early Birthday Ginthetwilightswords XD ! Note: Why not clouds on here? I wanted it to be "original" XD! I've done over 80 layers on this, despite having been terribly sick(high fever ;_;). I'm dizzy from the drugs XD! Anyways, this is what an honor student was doing instead of studying XD. Reason:I was shocked when I saw this. This is shocking O_O! This does look good. I really like it. I would also like to say happy birthday to Ginthetwilightswords even though i don't know them and it might be a bit early to be saying that. wow, i really love this wallpaper, u did such a nice job!! 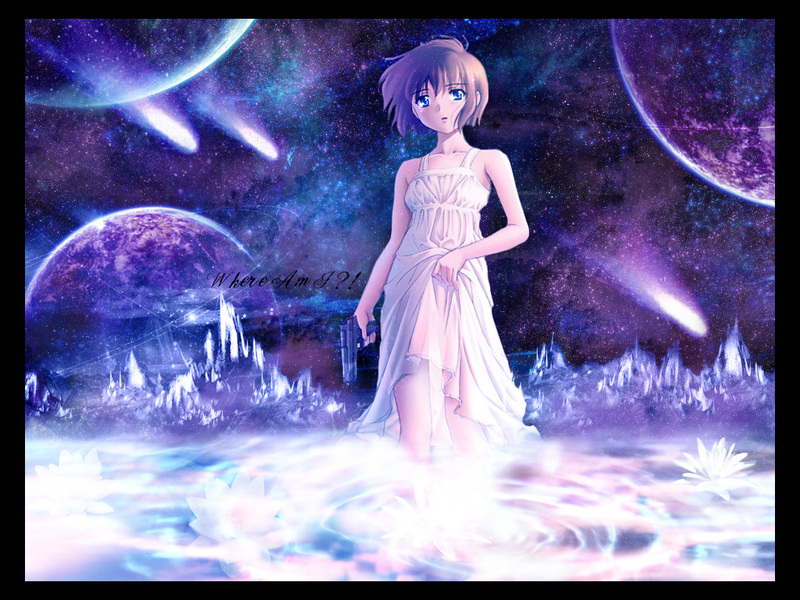 I like how u did the background and those comets, soo good! I like the constrast between the Earth, represented by the water and the lotus flower, and the space, represented by planets and comets. Another wall from glassy after such a long time ^^ Glad to see you working so hard on...um...schoolwork xD Anyways, the colours on this are simply amazing. Then again, your walls are always so colourful so it is to be expected-another masterpiece. The amount of planets in the background is bugging me but I guess it fits into the title. Let me see your latest work....wow, another fine piece of work you have done. You did over 80 layers? This tells me you are a perfectionist who will not stop until you're satisfied and you did it while you are ill. You are truelly talented and amazing waller. The background you picked is awesome. All that stars and planets as well as the mountain behind the character. Also, the effects beneath the character (water?) is very nicely done. Combined it gives me an impression of unforgiving place that you do not want to end up with. Great job you did but please get well first. This is absolutely beautiful. amazing background. Everything is just so great!!! Haha,so amazing works! !^_^ @_@ Wonderful!! this is such a gorgeous wall, and the combination of colors here are so beautiful! i luv the water effects on the bottom, and the star field is also very lovely! i also think the scan blends in seamlessly into your background, but did you mean to put those "stars" on her, too? your wall is absolutely stunning and is a visual treat! and please get better soon! too bad to hear that u'r sick, get well soon!! This is really pritty glassy! the flowers at the bottome are really nice as well. P.S. I might be stretching this lot more than I probably have with the staggering size of my comment, but I'd be willing to bet you'll see this in the Highlights soon ^uu^ ;) .